Visit the official college website. Click on Application Form. Candidate applying for the first time in UG/PG courses have to click on New Student. 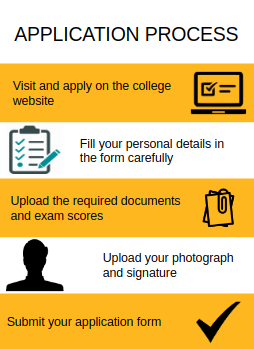 After the above steps, the application form will be displayed. Complete your application form with all the required information. Candidate will have to upload scanned copies all his / her certificates and mark sheets. Upload your photograph as well as scanned signature. Print the application form and bring the form along with self-attested copies of relevant documents at the time of admission. He/she should have got compartment in one subject only. He/she should have obtained at least 20% marks in the subject in which he/she had been placed in the compartment. He/she should have obtained the required percentage of marks in aggregate of the examination as laid down in the relevant regulations. A student having secured at least 50% marks in aggregate in 10+2 is eligible for B.Com 1st Semester & 2nd Semester on basis of merit, subject to the availability of seats. Applicants seeking admission should have passed 10+2 examination (Medical / Non-Medical) examination or any other equivalent examination recognized by Punjab University with at least 50% marks in aggregate at this level. All the students who have passed B.Sc with the relevant subject having at least 50% marks in aggregate, from Punjab University or any other recognized university are eligible for admission. The eligibility criteria for joining Post Graduate Government College for Girls was marks and I scored 93.6 in my 12th CBSE board so the marks cut off was above 92 and luckily I got admissions. The hostels are quite big, green, clean and well maintained. The college has a very good infrastructure, it has a very hygienic, clean, green. Here we get the opportunity to interact with various cultures and a linguistic diversity. The teachers are highly educated and understand the views and opinions of students. There is a wifi facility on a campus. As it is observed that college students face a lot of security problems but this college provides us immense security. The eligibility criteria for admission in bachelor of commerce is that minimum 60% must be scored by the student in 12th exams. Centralised admission takes place held by Panjab University Chandigarh. No entrance exam is required. Admission is divided in two pools that is U.T. Pool and Others. U.T. Students get priority over others. Typical cutoff goes around 75 to 80%. The eligibility criteria is 12th pass in any stream for getting into Post Graduate Government College for Girls. In Post Graduate Government College for Girls, Chandigarh, the criteria is to have a minimum is 60% marks in medical stream and no entrance exam is conducted. Students are admitted into Post Graduate Government College for Girls on merit as per 12th score. No bribe or "approach" is going to work.